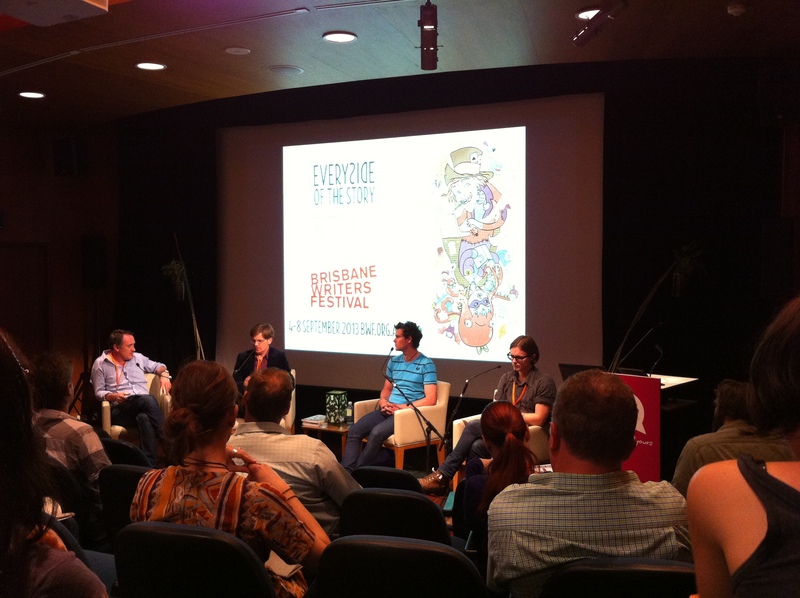 Last year the Brisbane Writers Festival was the first writers’ event I attended. EVER. I hadn’t known about it much in advance so only had a chance to attend one event. This year was different. I went crazy on events and had a blast. On Thursday I attended a panel on ‘The Unvarnished Truth About Publishing’. Meredith Curnow(Random House Australia), Bernadette Fowley(Hachette), Rochelle Fernandez(HarperCollins) and Kristina Schulz(UQP) discussed the realities of publishing traditionally, including but not limited to (not a direct quote, but the pure essence is here) read the frigging guidelines. This was a theme that popped up in several panels I attended over the weekend and I can’t help but wonder about how many people must fail this. On Friday I attended two workshops: Short Story Critique with Rob Spillman and Angela Slatter, and Slash and Burn Self Editing with Kate De Goldi. The Short Story Critique session saw us cram feedback for twelve pieces into three hours. I received some good feedback on one of my more recent stories ‘Glass Bones’ and was totally jealous that an English teacher had brought some of his students in to have their pieces critiqued. Most of the student’s stories didn’t read as young (seriously impressive!) but my jealousy derives more from the fact I never got to enjoy such a cool field trip(don’t worry Mr. Cameron, you were still awesome, I understand we lived in a rural town and these sorts of festivals didn’t happen back when I was in High School). Saturday saw me attending a lot of discussion panels. The first – Fantasy: Myths, Dreams and Other Worlds with Garth Nix, Kimberley Freeman(Kim Wilkins), Melina Marchetta and Angela Slatter, was right up my alley and there were some great quotes which, the only reason I didn’t tweet was because I didn’t want to miss the next one while fumbling with my damn phone. I’ll share them here instead. “The bower bird mind” – Angela Slatter, in reference to the way a writer’s mind gathers up an idea there, a fraction of a myth here, and then a skerrick of a story there and puts it altogether to make a beautiful nest. “Vikings make me feel good.” – Kim Wilkins. It was agreed by both panel and audience that needs to be made into a shirt. “Magic needs to feel mysterious” – Garth Nix, in reference to the way that so many people demand all of the workings of magic need to be revealed and his personal feeling on that. The Dystopia panel with Scott Westerfeld, Marriane dePierres and Max Barry was also a quote fest (as well as successfully making me want to buy more books, damnit). The Agents Seminar with Sophie Hamley and Hannah Brown Gordon was fantastic as Hannah is an American agent, while Sophie is Aussie so you got to learn the differences between the markets – and the similarities! These lovely ladies divulged things like how many queries they receive (and trust me, you can much more easily forgive a 6-8 week response period when you hear they receive 10-30 queries a day). Some of the advice they gave for approaching them was old hat (at least to anyone who has used google) like make sure you’re sending it to the right agent and that gem from the Unvarnished Truth About Publishing panel: follow the damn guidelines, but there were a few things where the internet didn’t always say the same thing(or where Australia differs from America) so having clarification from the agent’s own mouth makes you feel much better. Fables and Folk Tales with Angela Slatter, Kate Forsyth and James Bradley was a great panel and funnily enough all three authors had reworked the Rapunzel fairy tale (Kate’s is Bitter Greens (you can read my review here, review spoiler: I loved it! ), Angela’s I haven’t read yet, but I just bought her book Midnight and Moonshine and intend to read it for my September book on the Aussie Spec-Fic Authors Challenge, and James’ in a fit of genius I forgot to write down and can’t seem to uncover which book it is (I’m so sorry! If you know which one tell me so I can put it up here)). On Sunday I mixed it up a bit with a Short Fiction workshop in the morning run by Graeme Simsion, then a panel on Lit Mags with Stuart Glover, Rob Spillman, Sam Cooney and Tom Doig and wrapped up with ‘The Invisible Wheelchair’ with Alice Owen, Graeme Simsion and Robert Hoge. The Short Fiction Workshop was fantastic. Graeme led it from the perspective of a database designer, breaking the craft into factors to be carefully considered. It was a great approach I haven’t seen before and other takeaways from it were that I need to read some books on script writing, and to always be ‘writing for publication’ as the goal will help keep you focused on making your art glow. I strongly recommend if you’re a writer looking for courses and you see one being run by Graeme sign-up. The Lit Mags panel showed off so many different points of view from Rob Spillman (the editor of Tin House a prestigious literary magazine with gorgeous visual design and big names writing in it like Stephen King, Margaret Atwood and Ursula K LeGuin) to Sam Cooney (editor of The Lifted Brow a Melbourne lit mag that’s been around since 2007 and has published Neil Gaiman (which as we all know means I am immediately interested)) and Tom Doig(now-retired editor of Voiceworks, a lit mag for under 25 artists which takes stories, articles, comics and more). Their job titles might have been the same, but little else was. The magazines ranged from funded by a wealthy philanthropist, to government funded, to living-on-the-love-of-subscribers. Essentially though, they all had the same goal, to publish great stories. It’s always interesting to get a peek behind the curtain, and once again came the advice of ‘please, for the love of god follow the guidelines’. This time backed up with a comment that online databases may be a good place to find magazines and journals to submit to, but to not have faith that they have everything there. Go to the actual website of the people you want to be published by, they’ll tell you what they want and how they want it. Better yet, subscribe and read! There was supposed to be a big gap between the Lit Mags panel and my next seminar, but as I was walking along, listening to the audiobook of A Storm of Swords (yes, I’m ahead of the TV series now and all I want to do is talk with people about it but almost no one has read the books! ), I saw my friend and president of my critique group(Vision writers), Belinda. We had a chat and next thing I know she was bringing me along to her next panel ‘Well Drawn: Illustrious’ featuring Gary Crew, Gus Gordon and the previous president of Vision, Kathleen Jennings. It slotted perfectly in between my events and despite my personal lack of illustrating talent was a very interesting panel. “It’s a pretty thing, but you cannot miss that there’s a story going on in there” – Kathleen Jennings. “Information trapped in amber” – Kathleen Jennings on image panels from older books. I loved the belief all the panelists held, that it was sad any illustrated book was automatically assumed a children’s book. My last panel, ‘The Invisible Wheelchair’ was about the seen and unseen disabilities and how they are (or aren’t) portrayed in media. One in five people has a disability, but there is nowhere near that in fiction. Even I myself fall short, I have characters with OCD(Duke Oban in Storybook Perfect), a stutterer(Tobey from a WIP that’s on focus hiatus), a warrior with only one arm (Savrant from Keys, Clocks, Quests), and Brannory from my latest short story ‘Glass Bones’ has Osteogenesis Imperfecta (not to mention I cripple a few characters in combat on more than one occasion but keep them around for the rest of the book(or series as the case may be)), but I’m still way short of reflecting correct statistics. Robert Hoge said he wants there to be more stories of people with disabilities. They can be good, bad, cliché, he just wants more of them. I hope some of my stuff can get out there to become some of those stories and help (and hopefully they’ll be categorised as good). I almost feel like I could do a whole post on the topic! I met lots of new writers, spotted a few familiar faces from the Redlitzer Writers’ Day, saw some old teachers and many faces from my critique group, but sadly lacked the confidence to hand my card out to some of the new people I met (I handed out more cards for my critique group than myself, how sad is that?). I also managed to mangle my words more than once in front of people (both famous and other wise) proving how nervous I can be meeting new people (you wouldn’t think it once you know me ;p but it’s true, particularly when I’m interested in being friends or colleagues). All up though, the Brisbane Writer’s Festival was a success in my opinion. I socialised (with and without success), found new books (please don’t tell my husband! ), learned things and most importantly of all, had tonnes of fun. Also a big shout out to the volunteers and organisers, as a regular volunteer at Supanova(until I had my son) I know how tough it can be sometimes. I appreciate all you efforts! In summary(if this whole post was TL;DR for you) I highly recommend going next year if you missed it. Where ever I could I did my best to link to official blogs and webpages, if I missed yours or you would prefer me to link to a different one please let me know and I’ll be happy to do so. Did you say something about going to the workshop (or whatever it was) by Marjorie M. Liu? I wanted to go to that but it was too expensive. I’d love your notes, if that is something you went to. I have some basic notes on The Rise of YA and The Book Was Better, if you’d like them.